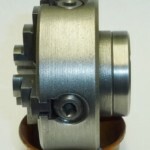 A professionaly manufactured wheel cutting engine of simple but effective design. 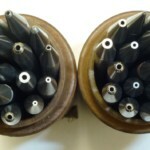 Comes with 2 count plates wityh a total of 24 counts from 45 – 150. 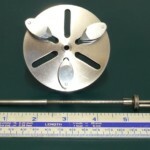 The spindle can be moved for centering up and the maximum distance between the spindle center and the wheel holding center is 4″ or 100mm. 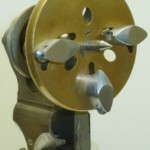 There are 3 holders (1 shown ) which take round HSS bar or silver steel single point cutters, 10 are included. 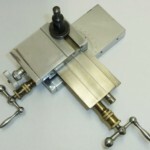 There are some flat single point cutters and they are 4x 55dp, 4 x 66dp, 4x 72dp. 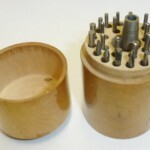 The splindle has a 7mm diameter so standard Thornton cutters can also used. 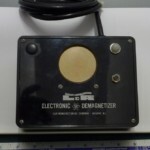 An added bonus is a metric dail gauge which enables accurate depthof cut to be achieved. 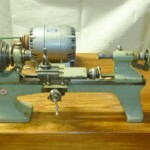 The Machine is powered by a small mains varaible speed motor and has a 2 speed pully onto the spindle. 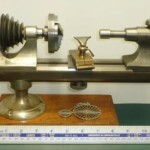 The weight of this wheel cutting engine is 9.4kilos and the footprint is 20″x 10″ x 10″ or 510mm x 255mm x 255mm. This wheel cutting engine is in full working order and represents very good value Made in Britain Built to Last™ Please call us if you need any further information. 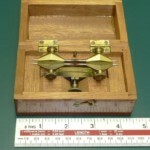 Buyer collects or aranges collection.